A James Cook University researcher is calling for greater protection for a critically endangered turtle that’s best known for its ability to breathe through its backside. Bum breathing icon’s future in doubt. The white-throated snapping turtle (Elseya albagula) is notable for a number of reasons including its large size (5kg+) and ability to extract oxygen from the water via cloacal respiration ("bum breathing"). 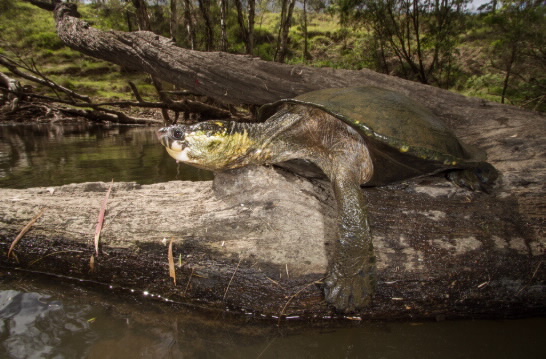 JCU’s Jason Schaffer has been studying turtles in Queensland rivers for the last eight years. His focus lately has been on the White-throated turtle in one of their last strongholds, the Connors River. He said that while they can be quite common in areas of suitable habitat (such as the Connors), it isn’t the case in other areas of their range which includes the Fitzroy, Burnett and Mary River catchments. Mr Schaffer said that there are very few new recruits into the breeding population due to the nearly 100 percent loss of eggs and young turtles. Mr Schaffer said the turtles have been hit by the restriction of movement created by the construction of dams and weirs, sedimentation and erosion from large-scale land use such as agriculture and mining and extreme nest destruction by introduced and native predators. Mr Schaffer said he would like to see more nests and intact habitat protected, with riparian strips regenerated in impacted sections to prevent more erosion/runoff and consideration given to the turtles when land and river use is contemplated. He said the Connors River was to be the site of a new dam but the scheme had been shelved a few years ago. He said there now appeared to be renewed interest in getting the project going again.